We are all the Divine seeking to express through the limitations of physical, and as we play and perceive through these self-imposed limitations we create expansion for the ONE. I am living in acknowledgment of the Magnificence residing within each one of us, recognizing that we all emanate from the ONE. 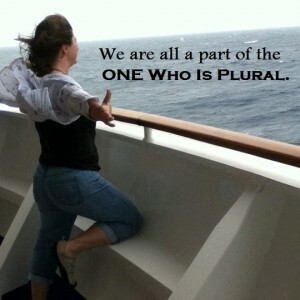 We are all a part of the One Who Is Plural. As I open myself to share from within, I offer to you evidence from my experience that we all are Loved, that we all are Love, that we all have a Divine Mission: a reason (many of them, actually) for being here in physical.